You have choices in digital map providers, and the two names that likely immediately come to mind are the powerhouses HERE and Google Maps. Does it matter which you choose for your project? It just might. 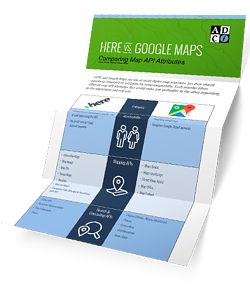 Our HERE vs. Google Maps: Comparing Map API Attributes infographic puts these two popular digital map providers side-by-side to see how they compare in key categories — it’s an easy-reference tool that helps you make faster, better-informed choices. Simply complete the form to access your copy of this handy infographic.